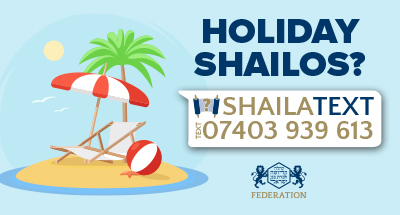 When staying in a rented self-catering cottage or flat or a non-kosher hotel, or even in a self-owned property far from any established Jewish community, many shailos can arise. The Federation ShailaText team has put together these frequently asked questions. Please note that the responses are intended to be a guideline and wherever possible one should consult one’s own Rov. Can I kasher the microwave in a holiday cottage? How? Many just double-wrap all food, taking care to ensure that any bags/wrapping don’t burst. However, if it is necessary to kasher the microwave, follow these steps. A) Ensure it hasn’t been used for 24 hours and that it’s absolutely clean. Do I need to kasher the sinks in a non-kosher holiday kitchen or is it enough to use a washing up bowl? You may use washing up bowls in a treif sink. Alternatively, metal sinks can be kashered by ensuring they are clean, leaving for 24 hours and then pouring water from a kettle immediately after it has been boiled, keeping the spout close to the surface and making sure that each part of the sink is completely dry when the water from the kettle comes into contact with it. Ideally you should then run cold water over it. Do I need to cover the counters and the shelves in the fridge and freezer? The counters will need to be covered if you want to put down anything hot. The shelves of the fridge/freezer do not need to be covered but should be inspected and if necessary cleaned, to ensure they are clean and free from food remnants from previous occupants. How do I kasher an oven in a holiday cottage? Does it make a difference if it’s gas or electric? The Federation does not permit the kashering of ovens from non-kosher to kosher. Everything that goes into the oven should be double-wrapped. How do I kasher an electric hob? It is worth checking before you travel what type of stove there is in your holiday house. Your pots should not be put down directly on a non-kosher stove top, unless it has been satisfactorily kashered or covered with foil or chicken wire. For a standard electric ring or electric metal plate on which the pot rests, clean the hob and turn each ring on to full power for 45 minutes. There is no need to wait 24 hours. However, for electric rings that are embedded into a glass stove top, kashering by heating it up will not suffice. We recommend that one bring along a couple of electric rings as the other option is to cover the stove top with thick silver foil – but this may crack the glass surface. How do I kasher a gas hob? Clean the hob thoroughly and leave on full flame for 20 minutes. Ideally, cover the hob with a blech or a simmer ring during this process. If you don’t want to kasher the hob, ensure it is clean and place chicken wire (or the wire grate from a disposable BBQ) between the pot and the hob. How do I kasher an induction hob? Induction hobs can not themselves be kashered, but they can be used if they are cleaned and covered with induction discs. To purchase follow this link . Can I use the dishes/cutlery/glassware provided by the holiday cottage if it’s just for cold food? Ideally a person should use kosher crockery, cutlery etc or disposable items. However, if nothing is available, one-off use of cups, plates, bowls and spoons for cold foods is permitted. Knives and (and even forks) should not be used due to the pressure involved in their use. Can I use the kettle provided by the cottage? If the kettle looks normal and has only a white residue inside it, then we do not need to be concerned that it has been used for boiling other things. It can therefore be used. Preferably wipe down the outside first and then boil it up once and discard the water. It can then be used as normal. However, if it has a black residue inside it then you should not use it as this would indicate it has been used to heat something other than water. Is it possible to kasher the barbecue in the cottage garden? It is very difficult to kasher a barbecue from treif, therefore you should rather take along disposable barbecues and use the properties barbecue as a safe place to rest it. Am I allowed to buy pas palter and/or chalav stam when on holiday away from an established Jewish community? When you are not staying near any shops where kosher food can be purchased, you may eat genuine pas palter products (obviously ensuring that all ingredients and equipment meet kashrus requirements). There is no heter to use products with unsupervised milk (cholov stam), both food and drink, in this situation. The property owners have left jars of coffee and sugar, bottles of oil etc for cooking. These are all kosher-certified or approved but have been started by the previous residents and presumably used with non-kosher cutlery, crockery, in non-kosher food products. Can I use these items or do I need to start new jars/bottles? You should not use these items but should rather bring your own along. They have also left a welcome bowl of fruit out – no idea if any of it might be from Israel and this a maaser question. Can I eat it? Yes, in this situation you can assume the fruit does not originate from Eretz Yisroel and need not have any concerns about shemitta or maaser. How do I know what time to bring Shabbos in and out? The simplest way is to enter the postcode of the place you are staying into a website such as myzmanim.com. Remember to write down the time of motsei Shabbos on a piece of paper so you can access it during Shabbos! There is no minyan nearby and I’ll be davening b’yechidus on Shabbos – can I bring in Shabbos early as I do at home if I want to? Yes, you may bring in Shabbos at any time after Plag Hamincha. How do I know how far I can walk on Shabbos? The calculations of techum Shabbos are very complex – you need to check with your Rov so they can work out the necessary measurements for you. the fridge light does not seem to be removable, how can i use the fridge on shabbos? For a full answer to these questions, please see our FedTech web pages by clicking here. Before you go, best to travel, best we advise you to pack some strong sticky tape, strong magnets and even a time switch. Try the tape or magnets as per our FedTech instructions. If even that fails, set the fridge on a timer, and open the door when the timer has all removed power from the fridge. To purchase magnets click here for our online order form. My cottage / hotel room does not allow the lighting of candles indoors – what do I do for candlelighting on Shabbos? If there is no option to use candles in any part of the building then you should switch on a regular filament light and have in mind the intention to fulfill the mitzvah of Hadlokas Neiros with that. There are differing views regarding whether the brochah should be made, so ideally consult your own Rov on this – but the default position would be that no brochah is made. The cottage has an automatic sensor light in the front /back garden that is activated at dusk and goes on whenever someone walks past it – if I can’t figure out how to disable it, does that mean I can’t leave the house after dark on Friday evening / Shabbos evening? This is a debated point but there is room to allow going out as long as you don’t actually need or specifically intend to benefit from the light. An important point for consideration is whether the area is lit by other light sources; if it is so dark that it is unusable you should not leave the house in this direction. The property has a cleaning service which comes in every Saturday. Are the cleaners allowed to vacuum and do other melochoh seeing as I haven’t asked them to come and they are really doing this work for the property owners and not for me (but I will of course benefit from the service)? Even though you will indirectly benefit from the service it is permitted and you do not have to be concerned about this. I’m staying in a non-kosher hotel. If a non-Jewish guest is using the lift on Shabbos and pressing all the buttons etc without me asking, would I be able to use the lift with him? No this would not be permitted. I am in a hotel and the lights in the corridor switch on as you walk in. What do I do regarding Shabbos? We are in a non-Jewish hotel. Are you able to ask for a hot coffee on Shabbos either in advance or on the day? One may not instruct a non-Jew to perform an action prohibited for a Jew. You would need to know what the hotel’s hot water arrangements are. If they have push button hot water you could not order a coffee or even hot water like you can’t operate the machine yourself. Ordering before Shabbos would also be prohibited.Water already in a dedicated (for kashrus reasons) hot water jug may be used if it was filled for public use. You may find this at a coffee bar table.If they have pre-heated water in an urn you could ask for some. This is permitted even if the hot water may have been heated on Shabbos as the intention was to serve the general non-Jewish clients and not the Jewish guest specifically. In both of the above cases you can add instant coffee as you do at home. Remember their crockery can’t be used and you would need to use disposable cups etc. What do I do if I come up against issues when I’m on holiday that have not been answered in this guide? We always recommend asking your local Rov where available but if not feel free to contact ShailaText. Our service remains active over the summer – simply text your question to 07860 017 641 for a response within four working hours. Please give as much detail as possible, which will ensure a speedier response to your question. Our guidelines online guidelines/FAQs are constantly being updated.